The convenient, disposable COMBI Laryngoscope set provides a strong metal blade permanently assembled with the handle and battery. 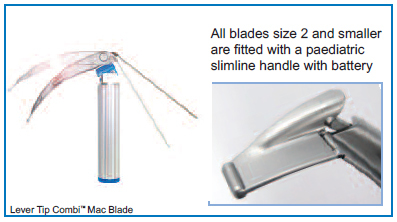 Saves time and reduces labor costs related to managing and cleaning separate blades and handles. Unique test in bag feature. Steel runs through the hook-on for maximum strength. A variety of blade styles available including Macintosh, Miller, and Lever Tip. PROACT Combi™ sets offer unparalleled reliability and performance with regards to airway management and are ready to use in less than 5 seconds. Now also available in Lever Tip configuration, the Combi™ Laryngoscope range provides an all-in-one solution, including a permanently attached handle, pre-loaded 6V battery pack and complete with a color coded test-in-bag protective sheath. The simplest, fastest and most dependable airway management and testing solution available, contact us to try for yourself. We believe that this system is up to 10x more reliable than many other comparable competitive products! Ready for use in less than 5 seconds! 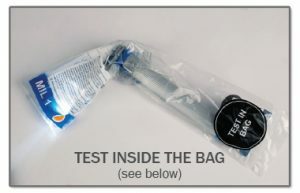 Essential test-in-bag capability for repeated testing and real peace of mind. Non-removable Metal Max™ blade permanently attached to a lightweight, super strong, aluminium full metal handle removes hassle and compatibility issues. Super strong Metal Max™ blade with steel through-the-hook for maximum strength. Full length blade spatula and ET tube guide surface – no compromise. 31 percent lighter than the equivalent set when fitted with normal batteries. Long battery life: Over five hours continuous illumination and three years battery shelf life from the date of manufacture. Fast and easy battery removal at end of life. Eco-friendly design ensures ease of disposal and environmental efficiency. Supplied in easy-to-open color-coded packaging. New extended range including Stubby handle and Cardiff PRO variants. Each unit can be tested while inside its packaging for peace of mind. 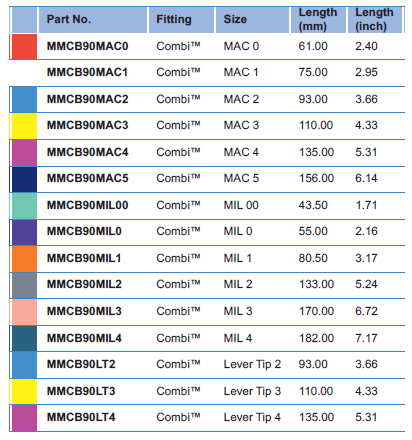 COMBI units offer ready-to-use reliability and performance.